The Katana sword was the samurais most important possession and symbolizes the bravery of the Japanese warrior. In this fantastic slot from Novomatic you will be thrown out in a Shogun type of theme. Collect three or more Katana symbols and you will unlock the bonus game where you will get 10 free spins and an expanding Samurai symbol that substitute for all other symbols except the scatter (Katana symbol). Graphics & Appearance: The Katana slot machine is all about the old Japanese samurai theme. The game window looks like it’s been taken from a scene in Shogun. The background is a Japanese forest and the game board has a wooden feel to it. The card symbols (Ace, King, Queen, Jack and Ten) has been neatly designed to look Japanese as well. Gamble Feature: The gamble feature in Katana is accessible as soon as you have won on the reels. You enter the feature by clicking on the Gamble button which is located in the bottom right corner of the game window, next to the Start button. Once you are in the gamble feature you will have to guess what colour the next card will have that will be revealed. You can choose between red and black. If you are lucky and pick the right colour your winnings will be doubled. You can then choose to either gamble again or return to the reels. 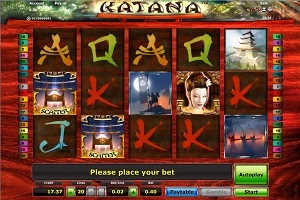 Game Symbols: The Katana sword symbol is the scatter symbol in this online slot. The wild symbol is the face of a mighty samurai warrior and it will substitute for all other symbols except the scatter. You will also see a Geisha symbol and some very nice Japanese temple and battle symbols. The lower paying symbols are the Ace, King, Queen, Jack and 10 which are nicely created to look Japanese as well. Bonus Feature: The bonus feature is triggered by hitting three or more Katana sword symbols (scatter). You will then get ten free spins that can be re-triggered within the feature. The Samurai Warrior (wild) symbol will expand over all positions on the reel during the bonus feature if a win can be gained. This symbol will substitute for all other symbols except for the scatter. Betting Options: The Katana is a 5 reel/20 line slot machine. You may configure the line and coin settings by using the + and – buttons in the lower left part of the game window. You can bet from 0.02 up to 5 currency units per line. Game Features: The Katana slot offers an Autoplay function which is very comfortable to use. You can start this function by clicking on the Autoplay button. Once the Autoplay has started you can stop it by clicking the same button again. The gamble feature is not accessible while in the Autoplay feature.